Friday started out by staying home due to a sick kiddo. He got called out of daycare on Thursday – and y’all, he was so pitiful. I don’t think I’ve ever seen him be so icky. He was shivering and got sick, and it seriously broke my heart. 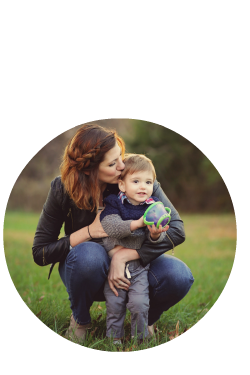 I was glad (and thankful) that even though I’m new to my job, they allowed me the flexibility to work from home. It’s so hard to be away from him when he’s feeling really bad. He wasn’t really feeling the eating thing, so when he woke up from his nap on Friday, and he told me that he was hungry, I was super happy. 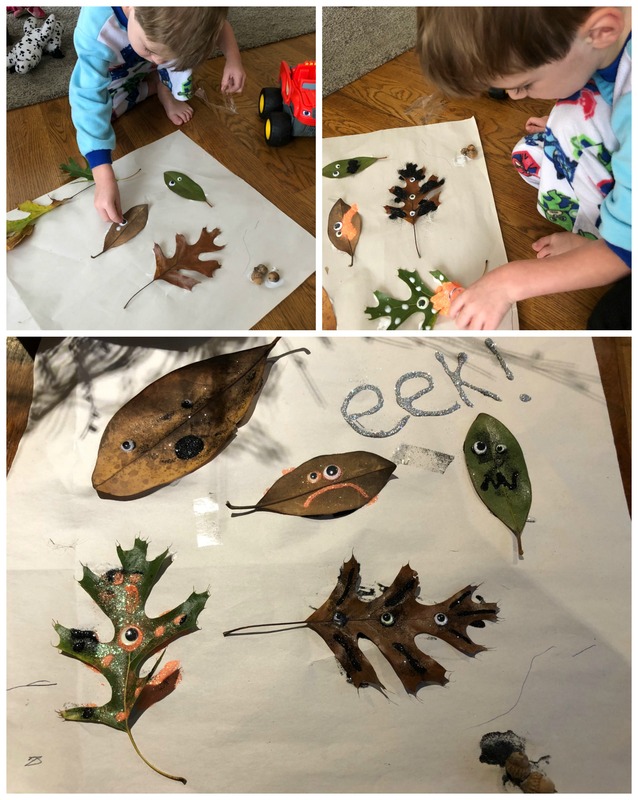 With the help of some Motrin, he was feeling a lot better by Friday night, so we ended up doing a fun leaf craft that night, while listening to some spooky Halloween music. 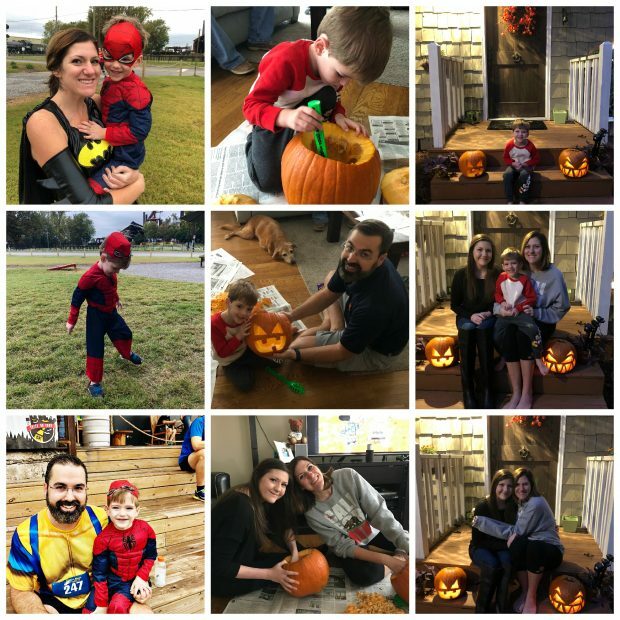 Saturday we got up and headed downtown for the Trick or Trot down at Back Forty Brewing. It’s a fun costume run, with a pretty decent course. I haven’t been training or running that much, so we didn’t push too hard on this. Plus it’s really hard to run with a running stroller, so we just did our best and probably finished around 34 minutes or so. It was fun getting dressed in our superhero costumes, and eating ghost and pumpkin cookies at the end. Later that day, Aunt Juney and Mr. B came over to carve pumpkins, watch It’s the Great Pumpkin, Charlie Brown, and to test run Mr. B’s chili for his works chili cook off. After it got a little dark, we went out and took pictures with our jack-o-lanterns. The chili was so good, and our pumpkins turned out pretty great, too! 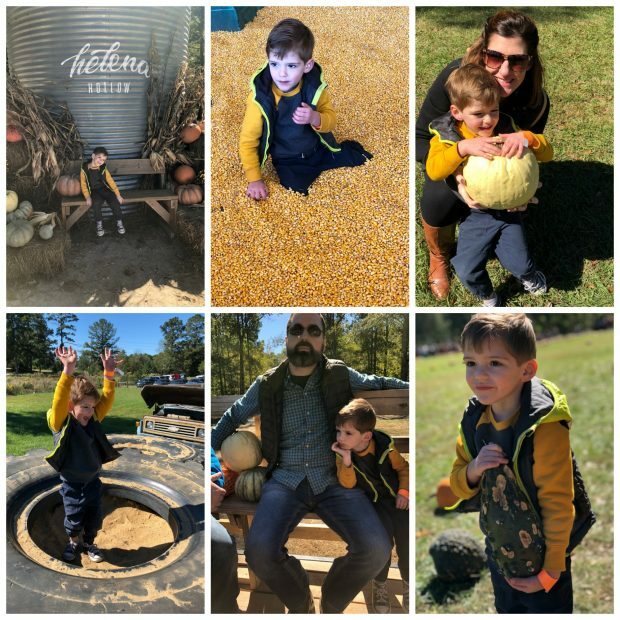 Sunday we met up with B’s parents at Helena Hollow to do the pumpkin patch thing. It was a great farm, with tons for kids to do. We’ll definitely be hitting them up again next year. We went as early as we possibly could, and it wasn’t that busy. It was slammed when we left though, so we’ll be getting there right when they open again next year. We ended the weekend with a bottle of wine, some popcorn and a Get Out viewing – and if y’all have never seen that movie, you need to. It was soooooo good. We have a jampacked weekend coming up with a Hocus Pocus party, Sheff’s first camping trip, a birthday party and the Homewood Witches Ride. I love this time of year – especially now that even us down here in Alabama are getting some fall weather! Definitely looking forward to Friday this week!! Hope you guys have a good one! I realllllly want to see Get Out! And I love that leaf craft! Just the cutest!